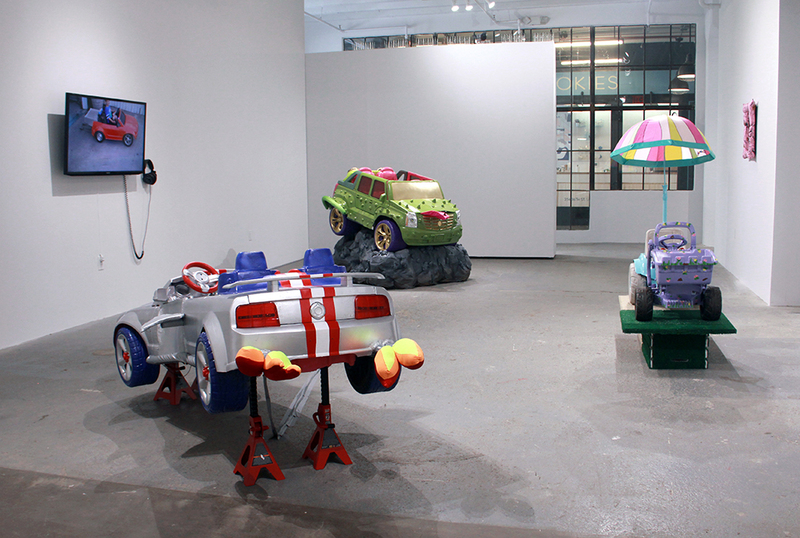 For this project, pre-owned ride-on toy vehicles were purchased from craigslist, yard sales, and flea markets. 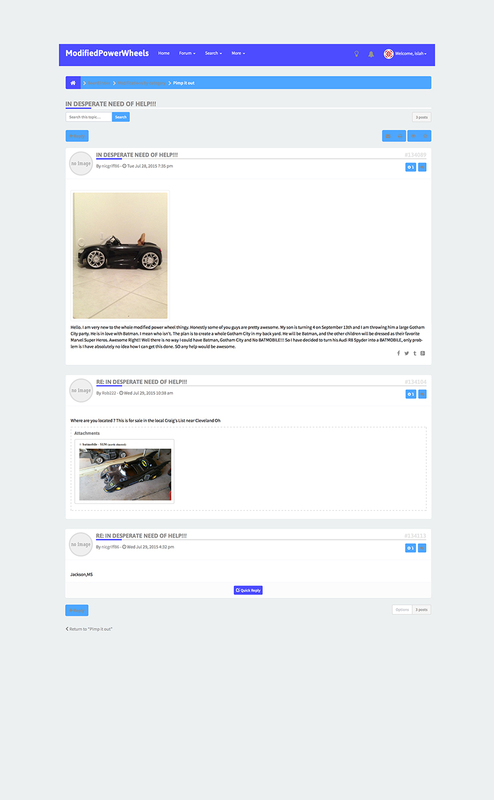 Their electrical systems, motor functions, and bodies were modified and those modification stories were shared online at modifiedpowerwheels.com to participate with the DIY community you will find there. 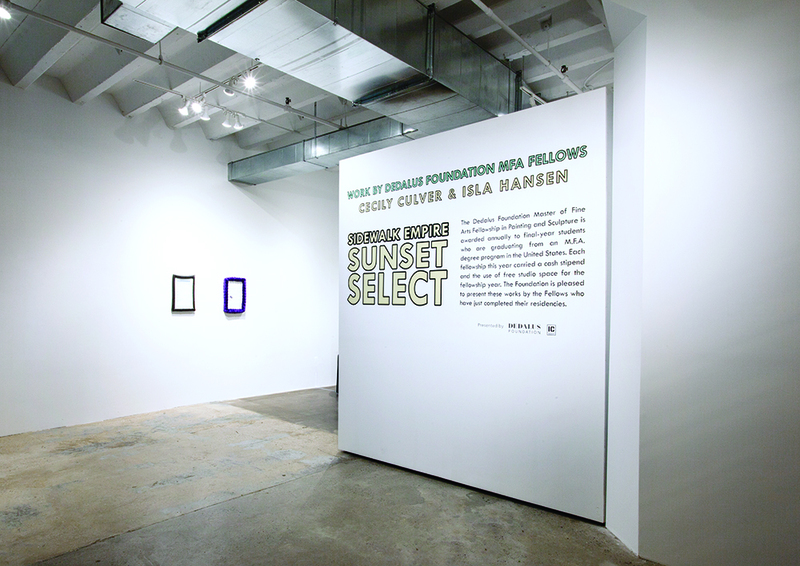 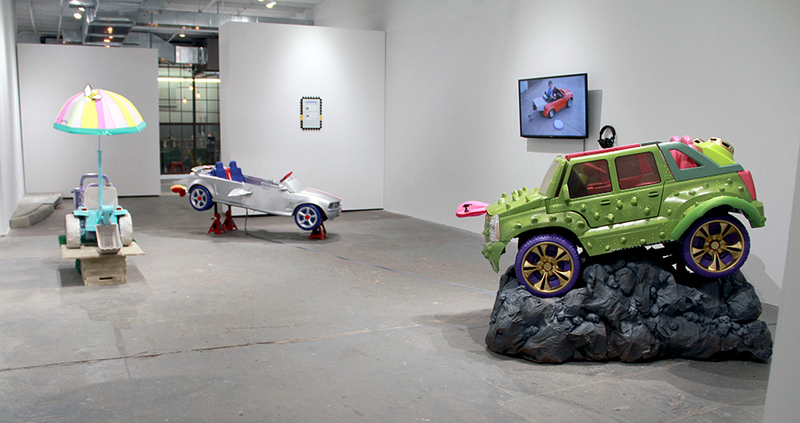 Four cars, four framed screen shots, and a video were on view at the Dedalus Foundation Gallery at Industry City (Brooklyn, NY) in July of 2016 as part of a two-person show titled Sidewalk Empire Sunset Select. 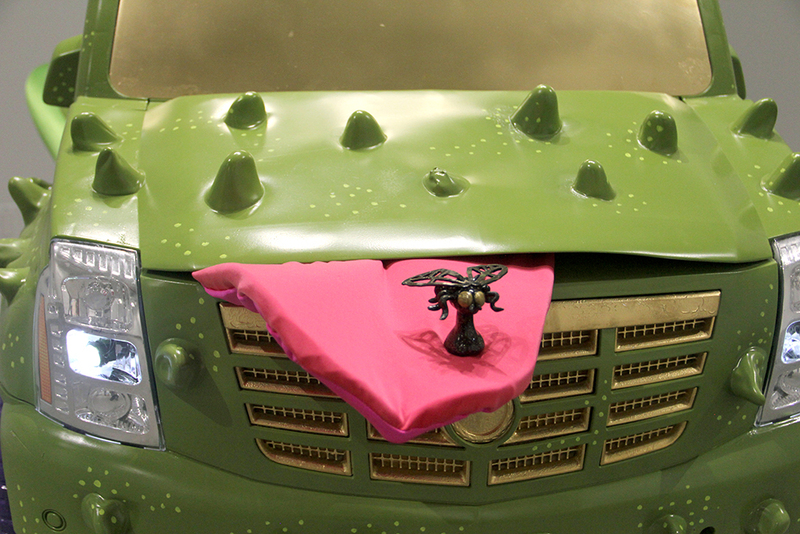 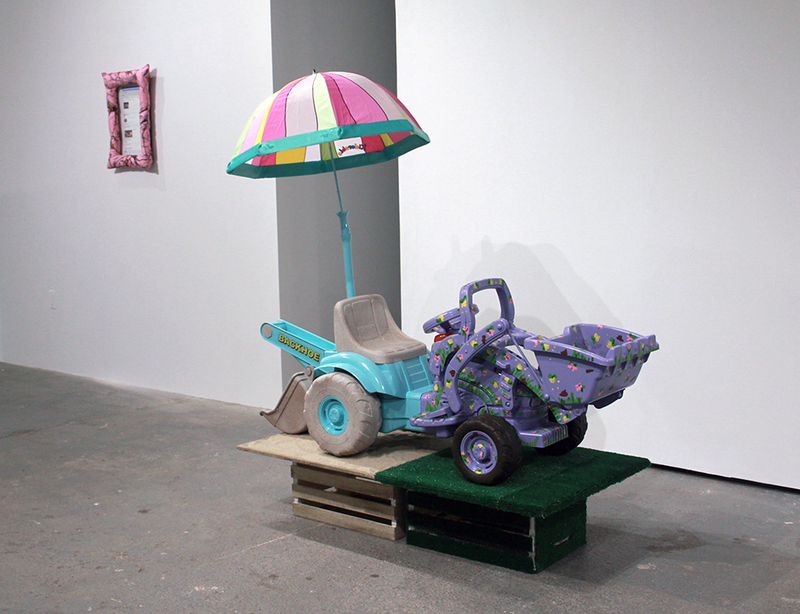 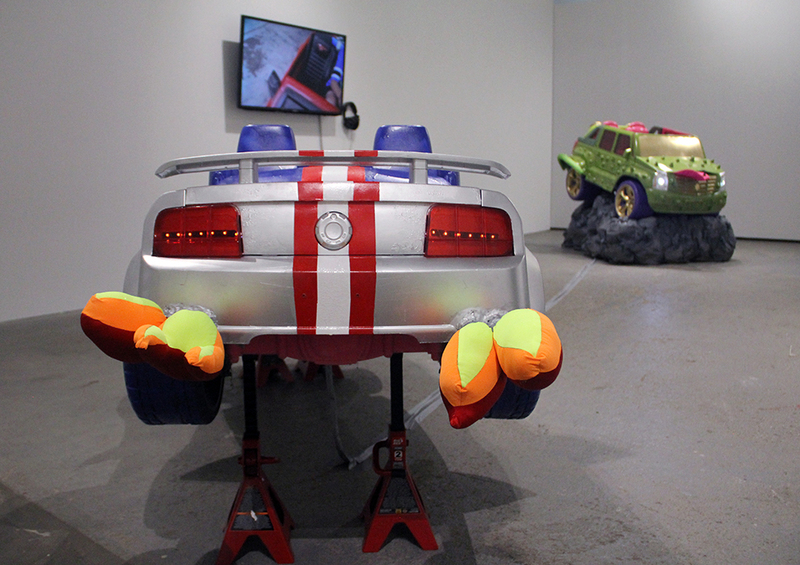 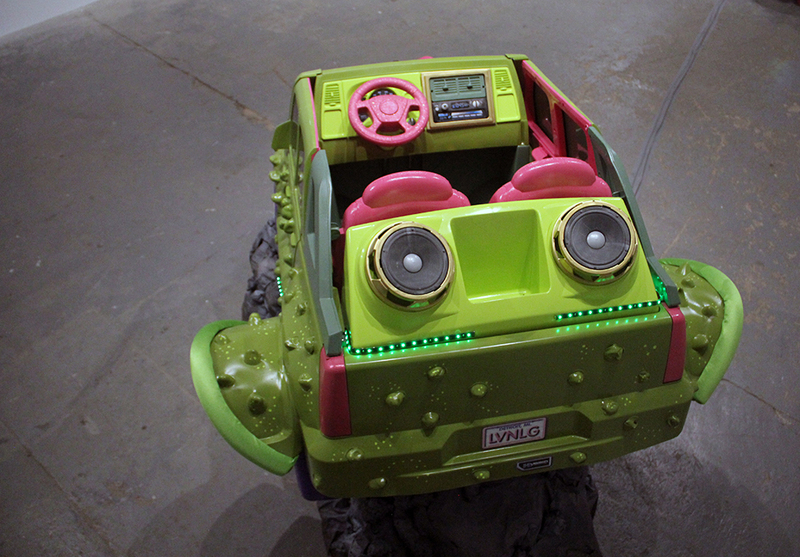 Modified Power Wheels Dot Com was on view a second time as part of the group show Engineering Utopia at Urban Arts Space in Columbus, OH in 2017. 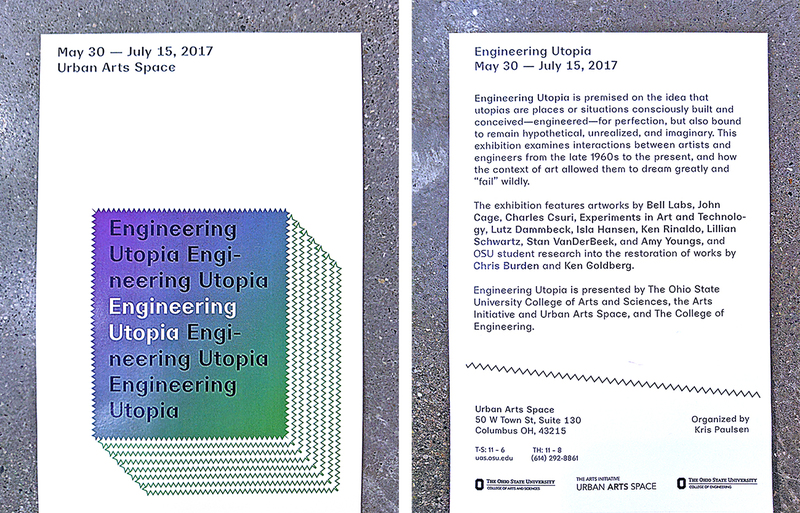 Engineering Utopia also featured works by Bell Labs, John Cage, Charles Csuri, Experiments in Art and Technology, Lutz Dammbeck, Ken Rinaldo, Lillian Schwartz, Stan VanDerBeek, Amy Youngs, and OSU Engineering Student research into the restoration of works by Chris Burden and Ken Godlberg. 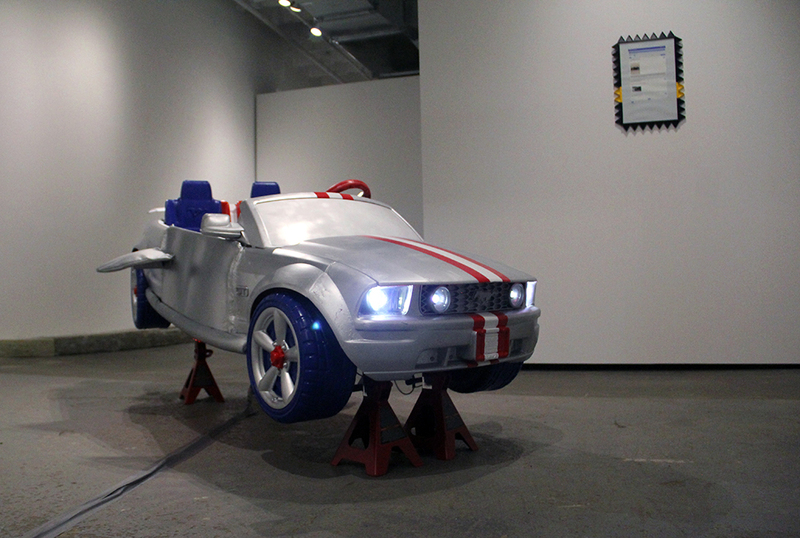 Modified 12v Power Wheels Mustang with polyethylene, polypropylene, paint, fabric, foam, aluminum, LEDs, custom power circuit modification. 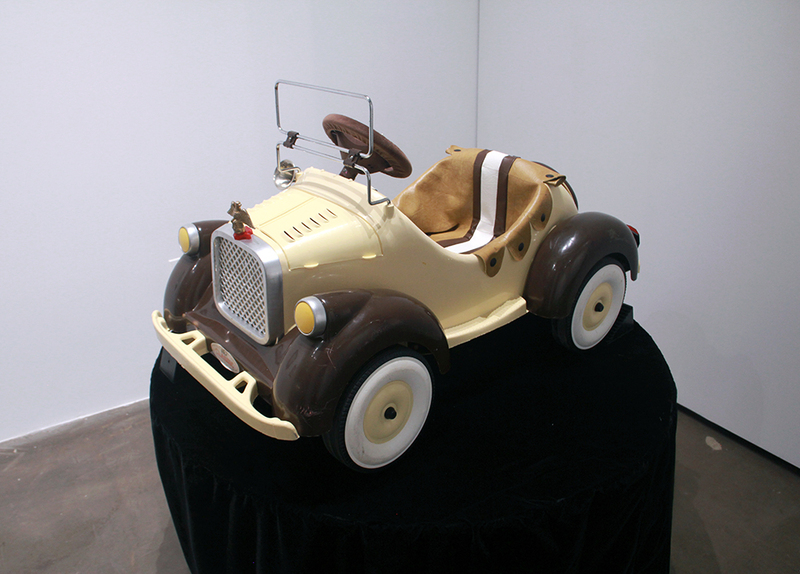 Original Pre-Mattel era 6v Pines of America Power Wheels Classic car with restored horn, seat cover, steering wheel cover, and turning pedestal featuring motor, wood, foam, black velvet. 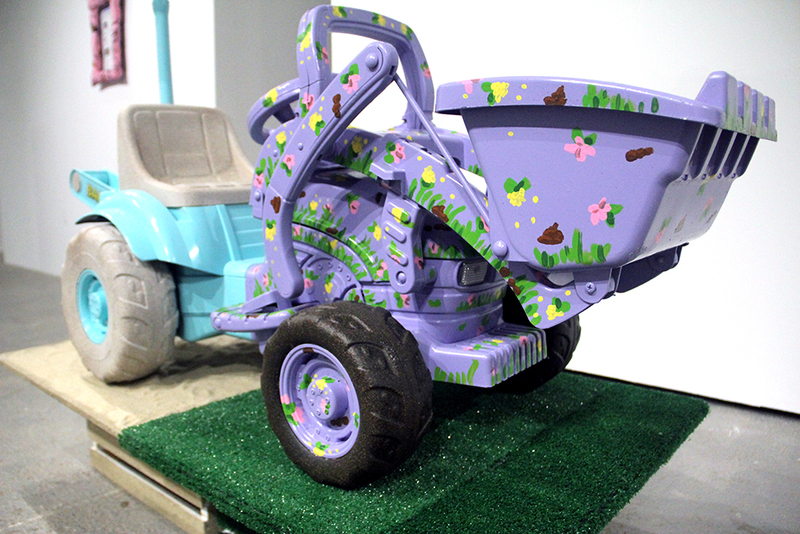 Modified 6v Peg Perego John Deere Mini Power Loader with paint, sand, astroturf, and umbrella. 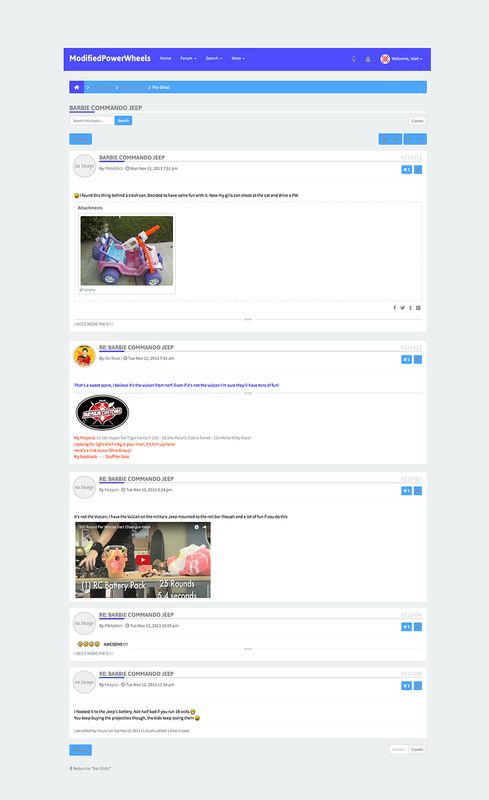 Four of ten framed screen shots of Modifiedpowerwheels.com forums featuring documentation of power wheels mods, DIY advice, conversation, and color commentary. 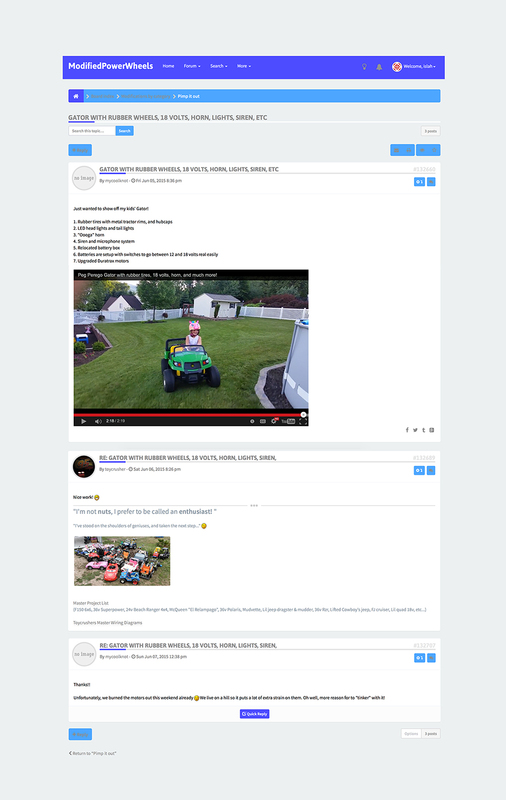 Montage of re-edited appropriated youTube videos featuring Power Wheels and Power Wheels modifications. 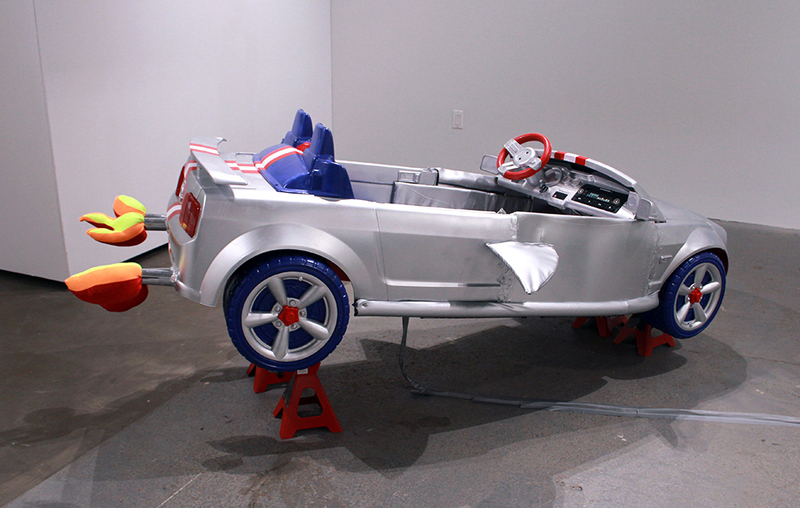 Modifiedpowerwheels.com is a longstanding and steadfast DIY community and a surprisingly cultivated website – now turned well-organized custom-designed forum– dedicated to the modification, upgrade, and fixing of ride-on children’s toys such as Power Wheels and Peg Peregos. 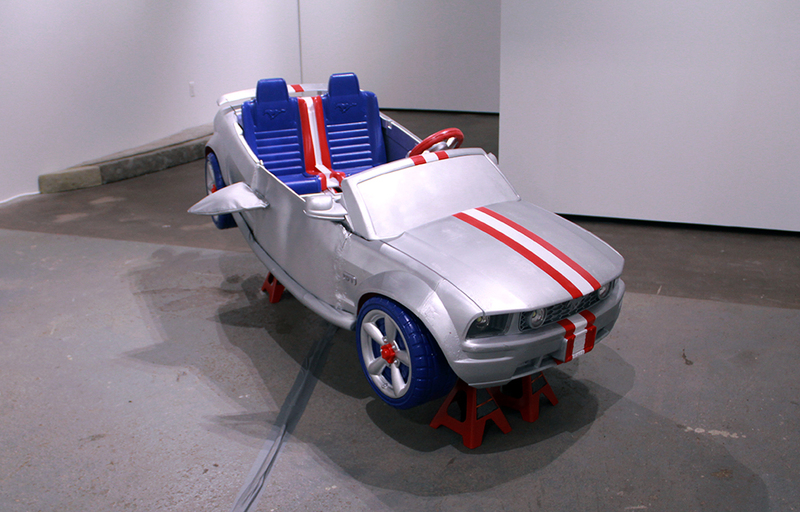 The top of the site reads, “Welcome to the Internet's only dedicated site to Power Wheels Mods,” and while it may not be the only source for information regarding do-it-yourself power wheels projects, it is one of few. 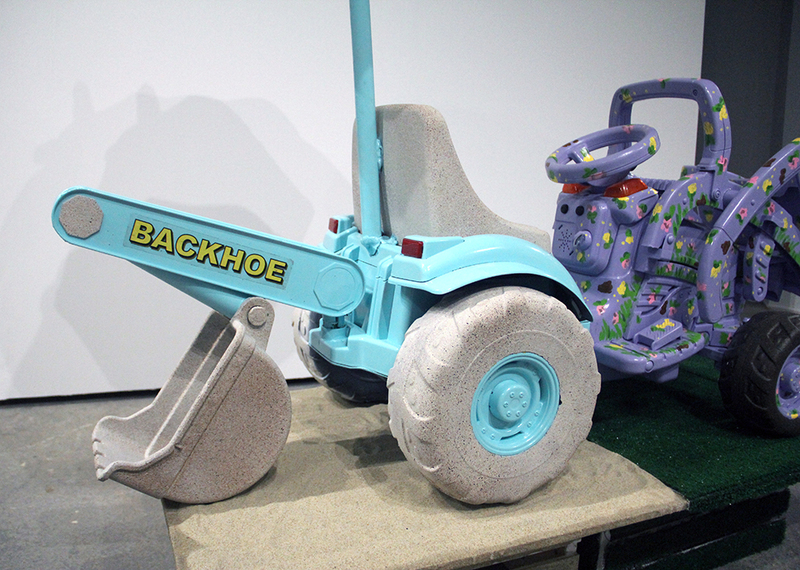 But perhaps the key word here is dedicated. 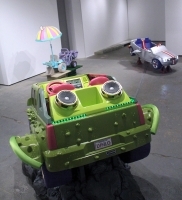 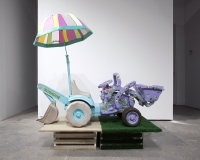 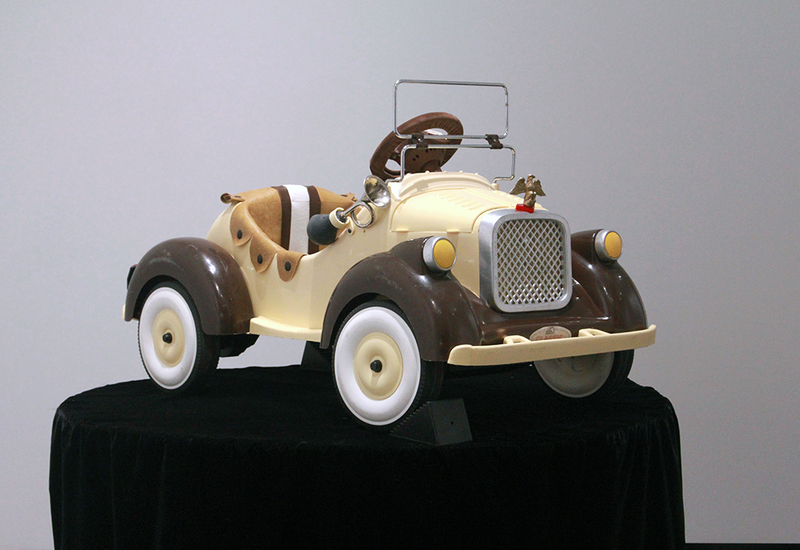 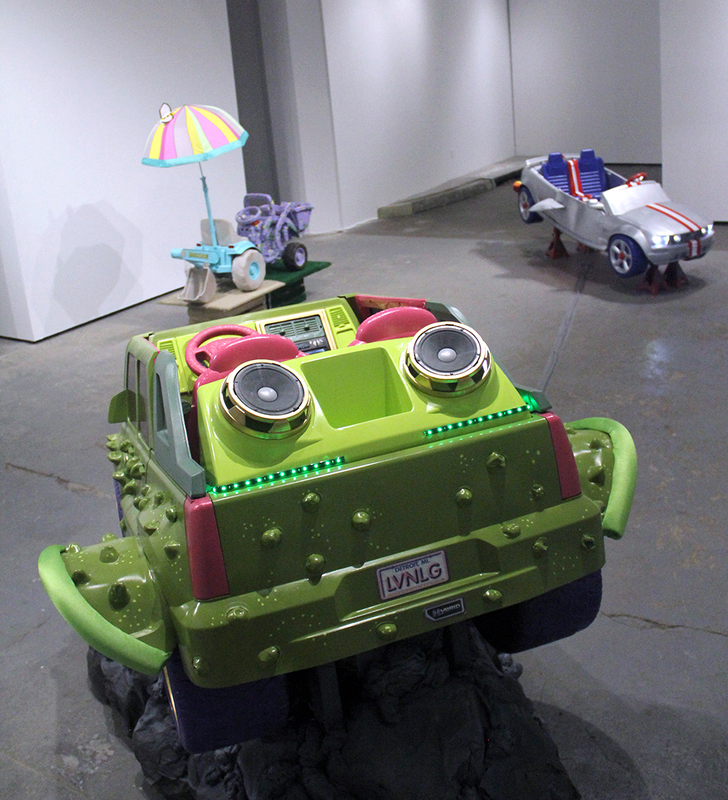 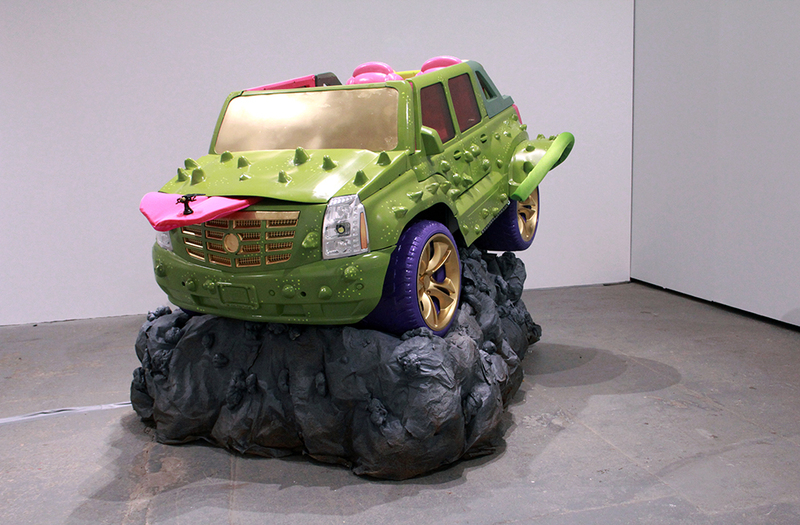 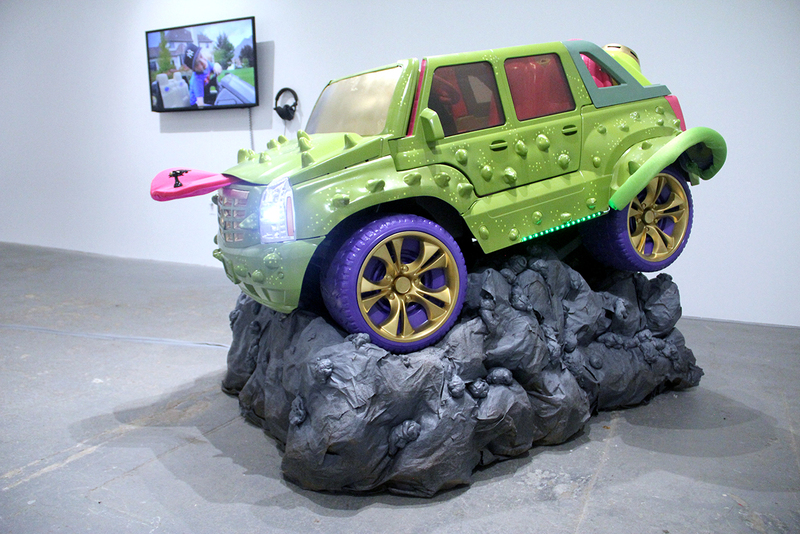 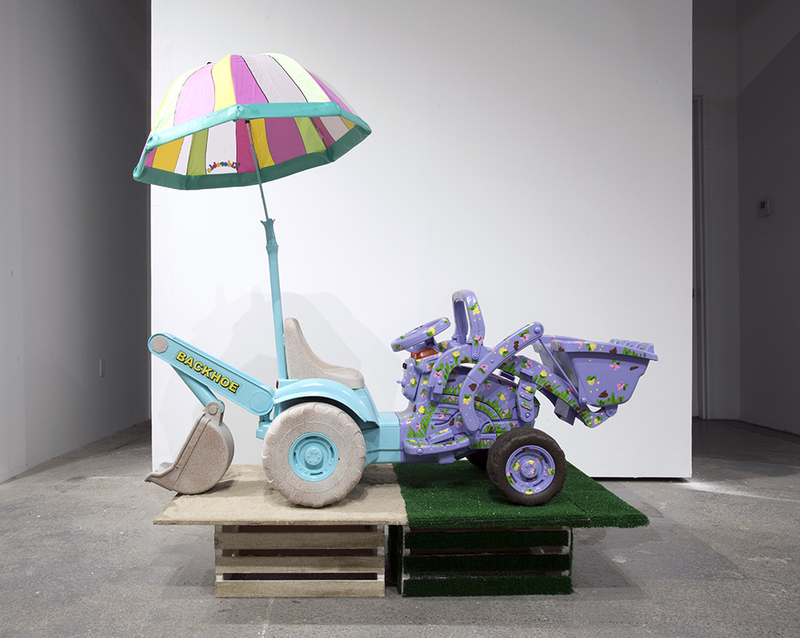 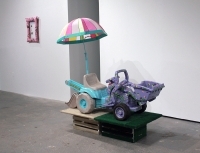 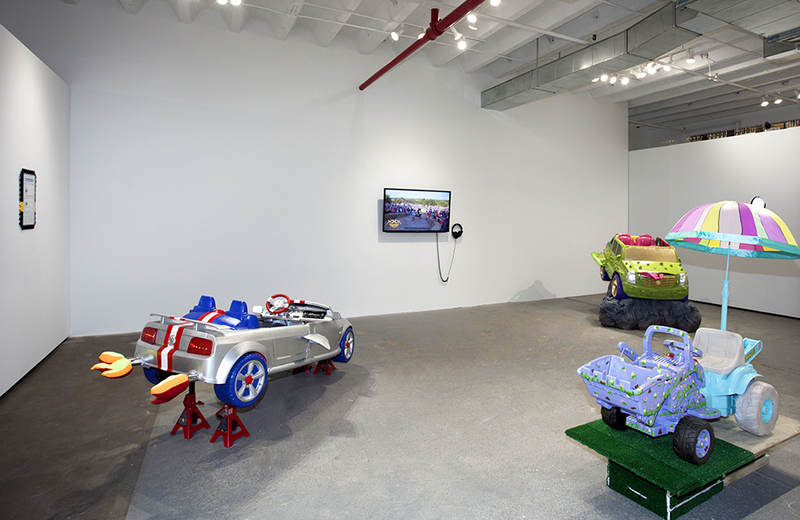 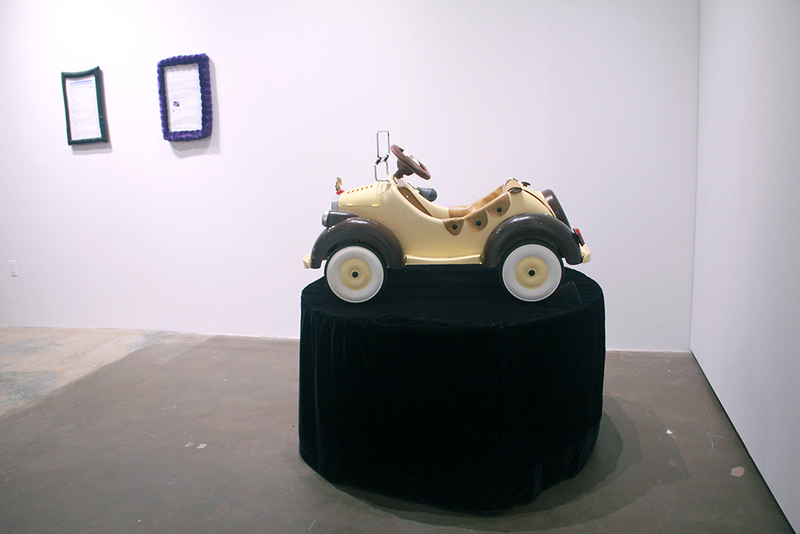 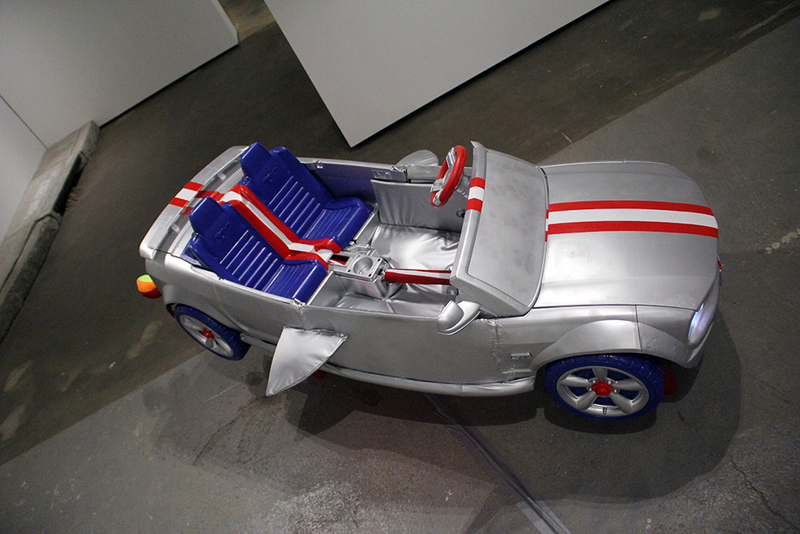 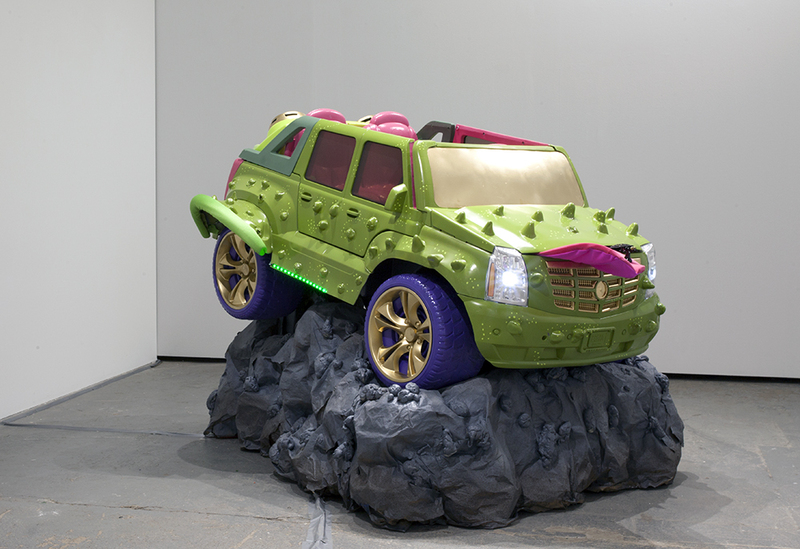 Simultaneously reverential to and subversive of the capital symbol represented by the mass-produced toy powered car, the projects exhibited on the site range from aesthetic alterations and re-gendering of the toy to complex electronic rearrangements that include power increases, LED installation, and the addition of remote controls. 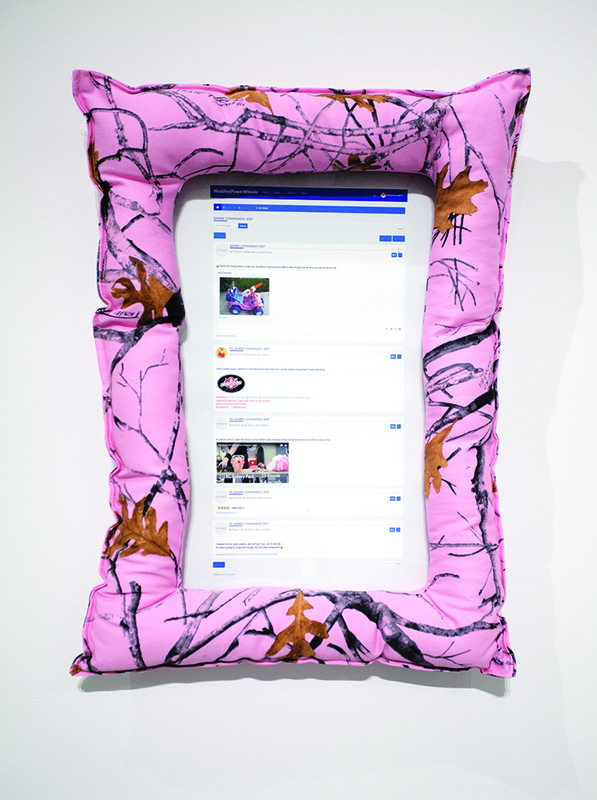 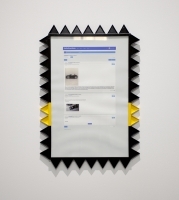 The nature of the dialogue that surrounds these souped coupes manifests relationships between parents and their children, the role the internet plays in the creation of culture, and perhaps even the place art holds in the middle-class household. 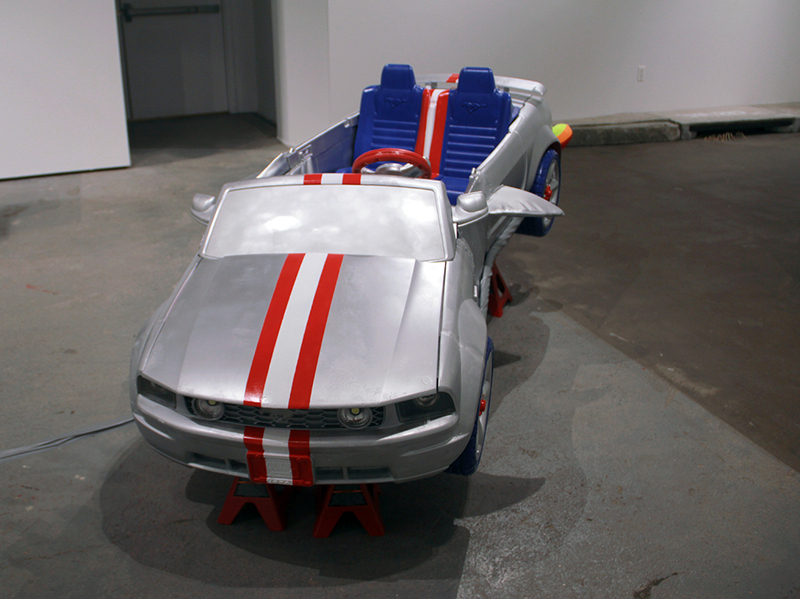 Who do these cars tell us more about – the kids who bring them to life with play, the dads who are altering them to go faster and faster, or the American industries behind technological toys big and small? 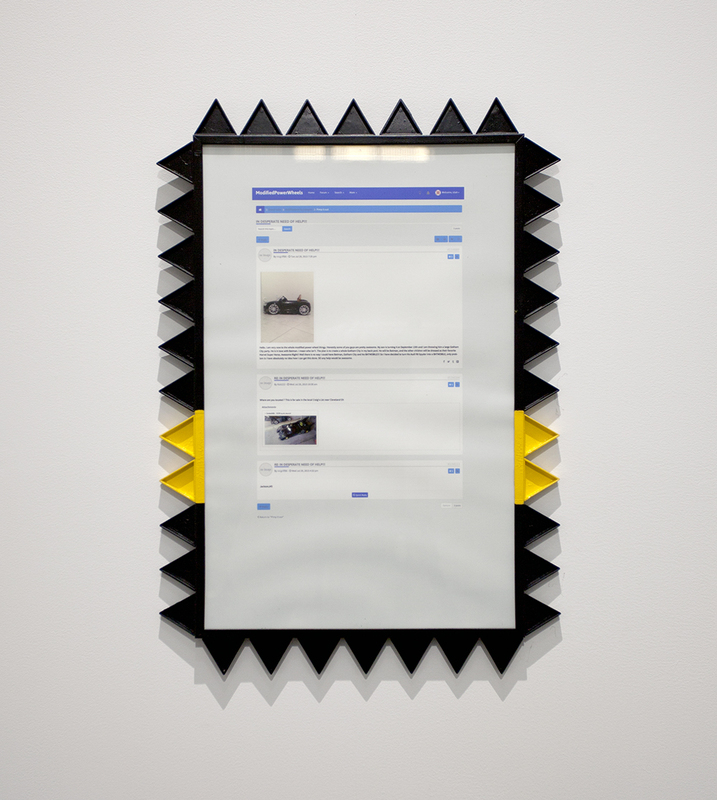 “ The disruptive impact of the Web has been uneven at best. 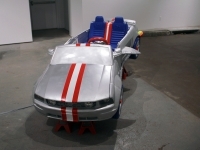 From one angle, power has been sucked to the periphery: new technologies have created space for geographically dispersed communities to coalesce, catalyzed new forms of activism and political engagement, and opened up previously unimaginable avenues for self-expression and exposure to art and ideas. 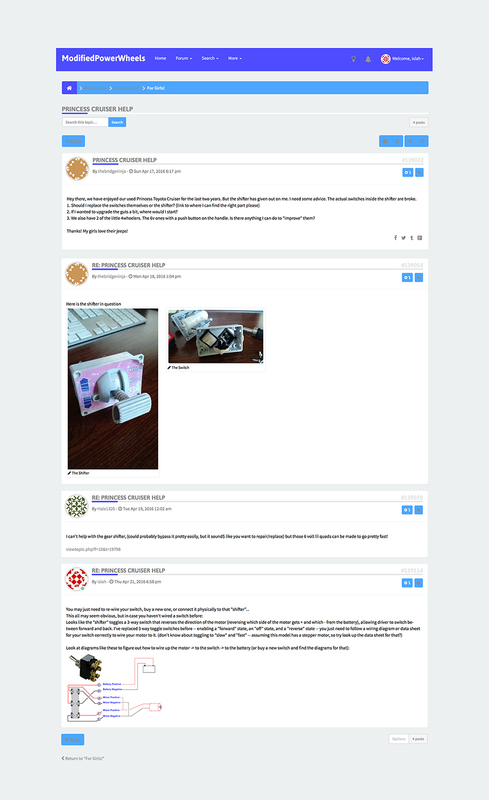 But if we look from another angle and ask how, precisely, the power of institutions has been eroded, the picture becomes murkier.